Moderate rain (total 18mm), heaviest on Tue night. Very mild (max 12°C on Sun morning, min 5°C on Tue night). Winds increasing (moderate winds from the SSW on Sun morning, strong winds from the SSE by Mon morning). Moderate rain (total 16mm), heaviest on Wed night. Freeze-thaw conditions (max 7°C on Fri afternoon, min 0°C on Fri night). Winds decreasing (gales from the SE on Wed afternoon, light winds from the SSE by Thu night). Moderate rain (total 11mm), heaviest on Mon afternoon. Mild temperatures (max 9°C on Sun afternoon, min 3°C on Sat night). Winds decreasing (near gales from the SW on Sat morning, light winds from the NNW by Tue night). 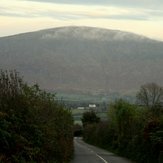 This table gives the weather forecast for Blackstairs Mountain at the specific elevation of 735 m. Our advanced weather models allow us to provide distinct weather forecasts for several elevations of Blackstairs Mountain. To see the weather forecasts for the other elevations, use the tab navigation above the table. For a wider overview of the weather, consult the Weather Map of Ireland.